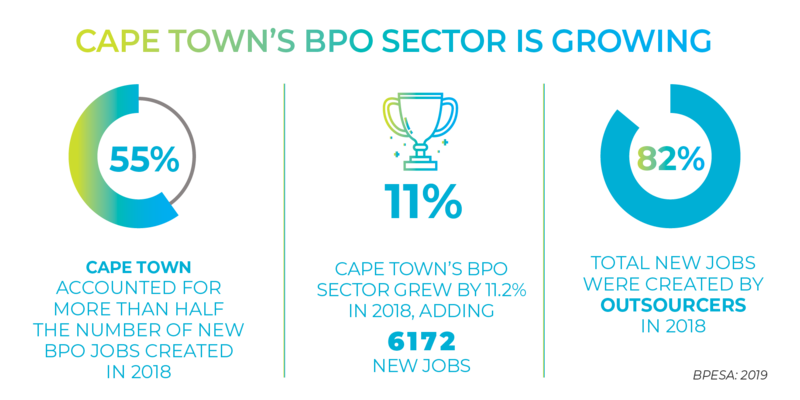 South Africa, especially Cape Town, is one of the fastest growing BPO industries in the world. The city’s edge is thanks to the industry’s rapid adoption towards an omnichannel approach to delivering next-generation contact centres and digital services. Cape Town companies are developing its analytic capabilities, building new digital solutions and even providing English language training applications to other BPO industries in China, Taiwan and Japan. IT infrastructure and App Development -providing back-end infrastructure services and solutions to various industry verticals. The innovative offering is strengthened by 60,000 relevant degree holders available for hire at the entry-level every year. It’s no surprise South Africa was named ‘Offshoring Destination of the Year’ at the Global Sourcing Association (GSA) Awards in 2018. Despite these incredible offerings, Cape Town offers 65-70% lower costs than a tier-2 city in England for contact centre work and 20-30% lower than those in Central & Eastern Europe like Poland (Everest Group Study:2018). It is no wonder South Africa’s BPO industry grew by 22% year-on-year during the past four years. It’s twice the global growth rate and three times faster than India and the Philippines. Cape Town is also making it easier for companies to invest. The World Bank’s Ease of Doing Business Report ranks the City highest in South Africa for dealing with construction permits and getting electricity to your business. The City is assisting with skill development initiatives, is expanding fast internet network and is facilitating access to incentives like the recently activates Global Business Services Incentive. Business Process Services incentive provides a lump sum cash incentive per job created for a minimum number of jobs created. And a bonus incentive paid at the end of five years. Seda Technology Programme offers grants to provide technical support to small and women-owned enterprises. Work readiness and Tech Skills Development Programmes between the City of Cape Town, universities, training institutes, and the private sector. The most prominent amongst these is the Cape Innovation and Technology Initiative which trains students in IT infrastructure, cloud, big data analytics, and now, cybersecurity and artificial intelligence skills. Impact Sourcing – implementation of 200 call centre learnerships in the Western Cape through impact sourcing. Cape Town continues to attract business from top firms across Europe, the United States and Australia. 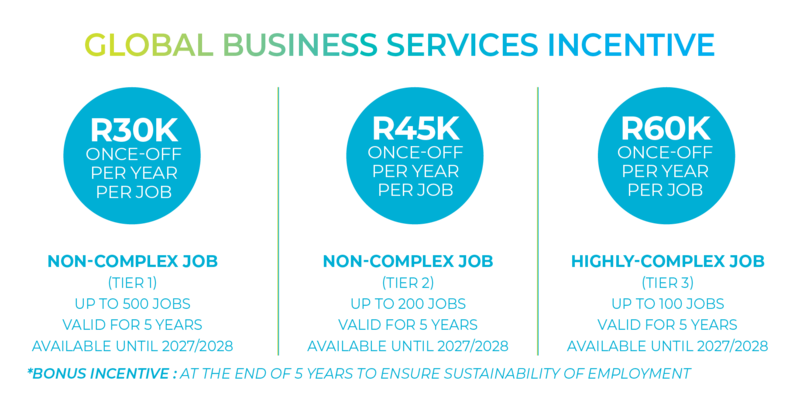 The city’s sector has already 61 036 jobs and services 61% of South Africa’s total international BPO market. 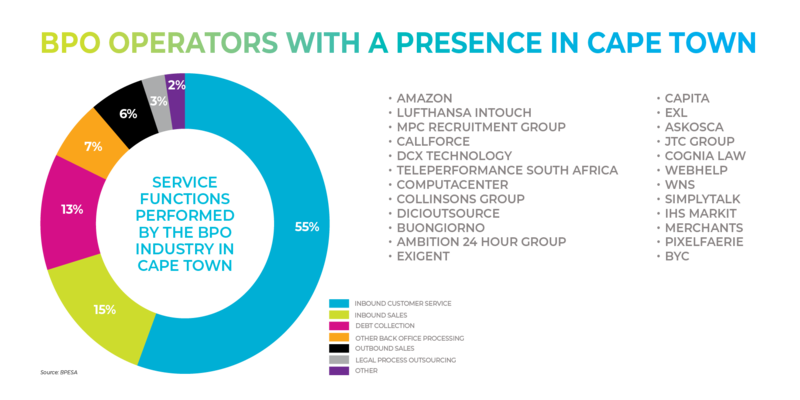 Companies like Amazon, Barclays, WNS, Old Mutual and many more call Cape Town their home. 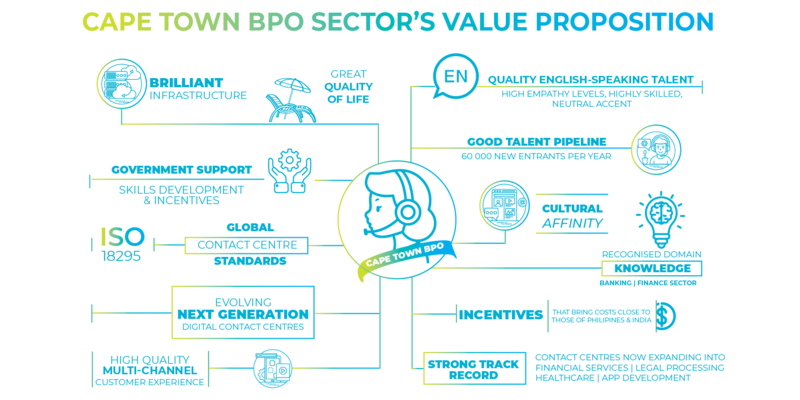 Impact Sourcing (IS) is also an integral component of Cape Town’s BPO industry. More than one-fourth of the global services market in South Africa is made up of impact sourcing. This is mainly driven by the contact centre industry. Companies are aware of the significant social impact they can make with impact sourcing while more employees are graduating from government and sector funded programmes.